It's not cheap, but the beautifully designed OP-1 is fun, inspiring and unique sounding. Oozes quality, innovative and versatile synth engines. Price, absence of velocity-sensitive keyboard. The OP-1 is built from aluminium and boasts a striking retro-futurist design. The OP-1's layout is simple, with a push-button keyboard and rotary encoders. The USB port is used for battery charging, file transfers and firmware updates. The OP-1 has a beautifully clear, bright OLED screen. 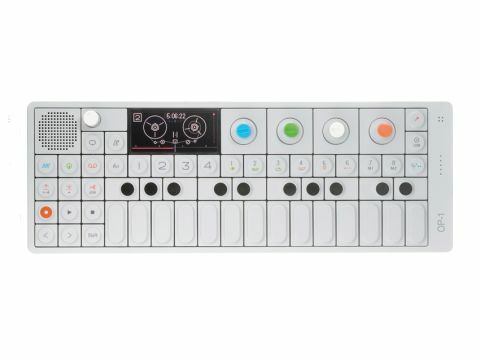 This is a cut-down version of the OP-1 review that appears in Future Music issue 245. Pick up the mag to read the full review. Reviewers are often guilty of exaggerating the excitement surrounding product releases. Every new synth is touted as "long-awaited" and "eagerly anticipated" even if it's plainly untrue. With that in mind, forgive us the hyperbole in this case. Teenage Engineering first showed off the prototype OP-1 at the Frankfurt Musikmesse trade show way back in April 2009. The envelope, effects and modulation may be simple, but the synth editing options are unlike anything we've seen before. Two years of rumours, speculation and gossip later, it's finally being released. This one time, it's OK to believe the hype. Since 2009, the OP-1 has been touted as an intuitive musical tool with a radical new approach. Even a quick hands-on session confirms that the hype is justified. The incredible build quality is backed up by an unorthodox but effective synth engine, excellent effects and that quirky tape recorder. Our only real complaint is the absence of velocity control. There's something inherently likeable about the OP-1. It's colourful, it's portable and using it makes us feel like we're playing with a very powerful toy. Since when has that been a bad thing? Don't expect analogue-style synth sounds, but take the OP-1 on its own terms and you'll discover that its synth engines can create a broad range of highly usable tones. A few sceptical commentators have questioned whether a market exists for an expensive portable keyboard with limited synthesis options and such an unconventional approach to almost every aspect of its design. But when a synth is this much fun, this inspiring and this enjoyable, it'll find its place in the market.